Inholtra Premium Lubri-Joint: The next step in the evolution of long-term joint support: The research on glucosamine is overwhelmingly positive. When taken at clinically researched levels, this joint nutrient can help support the production of cartilage, the soft cushion that helps protect the bones withing a joint from rubbing together. 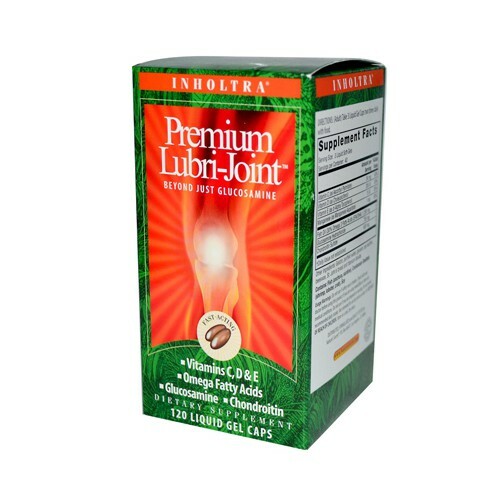 Building upon this amazing nutrient, Inholtra Premium Lubri-Joint combines a specific blend of vitamins, minerals, nutrients and essential fatty acids, all of which support joint and connective tissue health. Glucosamine helps repair and regenerate cartilage between joints. Chondroitin is a critical structural component of cartilage and provides a cushion effect to compression. Essential Fatty Acids EPA and DHA influence the balance and presence of inflammatory markers. An increased presence of EPA and DHA in the tissues helps to support a healthy inflammatory response. Vitamins C and E help to protect joint tissues from damage due to free radicals and support bone health. Vitamin C is also one of the building blocks of connective tissue, and ingredient necessary in the creation of cartilage. Ingredients to support the production of new carilage between joints. Omega 3 and 6 fatty acids to help support the body's natural healthy inflammatory response. Fast Acting Liquid Gle Caps are easy to swallow and release their nutrients fast for optimal results. This delivery form also allows Omega 3s to be provided in significant amounts.